Betfred: A Betting Site That Has Almost Everything? Unlike most sportsbooks, Betfred started as a single betting shop in 1967. It then became an independent bookmarker that it is now based in Birchwood, England. 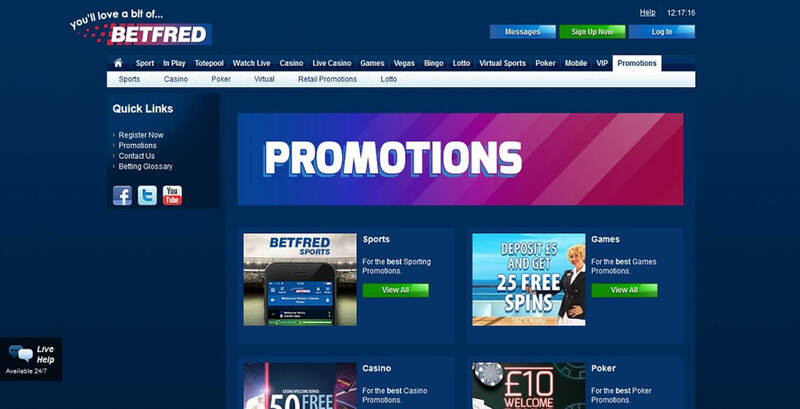 Although it is one of the longest-running betting sites in the industry, Betfred has been able to catch up with the growing technology as its site has a mobile app. Another reason why sports bettors prefer betting on this online bookie is its wide range of offers. It has a sportsbook, a live casino, and a poker room. The gaming site even has two casinos to offer. Players can bet in real time or even watch their preferred sports without making wagers. A handful of bonuses await each player as well. However, the betting site accepts only players from Gibraltar, Ireland, and the UK. Even worse, it was asked to pay a fine of more than £800,000 as the UK Gambling Commission found weaknesses in the social responsibility and anti-money laundering controls of Betfred. The site also received complaints from players regarding withdrawals. Betfred paid the said fine and added security protocols related to money laundering and fraud. It also resolved the issues on cash-outs and promised that players will receive their funds on time. Is Betfred worthy of your membership? Find out in this sportsbook review. Betfred is generous when it comes to giving rewards. There are bonuses for sportsbook, casino, live casino, lotto, virtual sports, and even poker players. You can get £30 free bets when you become a member of Betfred. Simply wager at least £10 in any sport with odds of 2.0 or more. The reward is credited to your account after 10 hours. Should you decide to withdraw, you should wager the amount once. Get up to £10 free bet return from the online bookie. Just place a 5+ Fold Football Match Result accumulator bet with odds of at least 1/3 per leg on selected leagues. The promo accepts straight accumulator bets only. The incentive must be used within seven days; otherwise, the site will remove the bonus from your account. The Double Delight promo rewards you double the first goalscorer price when your chosen player gets the first two goals in a match. The Hat-Trick Heaven promo, on the other hand, gives you triple your first goalscorer price if your player scores the first goal and a hat-trick in 90 minutes. There is no minimum bet required; you just have to bet any amount for a singles match. Receive a 5% free bet bonus up to £200 weekly from Fred’s Free Bet Club. Just have a total of £500 bets from Monday to Sunday. The reward will be in a form of free bets. Take note that the gift will expire within seven days after the free bet is credited to your account. These are just some of the bonuses that you can get if you are into sports betting. But if you prefer to play the Casino, Live Casino, Lotto, or even the Bingo sections, you can get other rewards such as a trip to Las Vegas, free spins, free golden chips, and cash prizes. Betfred’s Sportsbook section contains around 28 sports. You can wager on handball, ice hockey, and boxing. It also has the Special section in which you can bet on TV shows, awards, and even royalty. The Betfred sportsbook offers various betting types. You can opt for double, singles, singles take about, and double takes about, to name a few. You can even set the odds format to decimal, American, or fractional. The gaming site has a live commentary on football and other sports as well. If you are into virtual sports, navigate through the Virtual Sports section where you can bet on dash racing, football, horse racing, and greyhound racing. 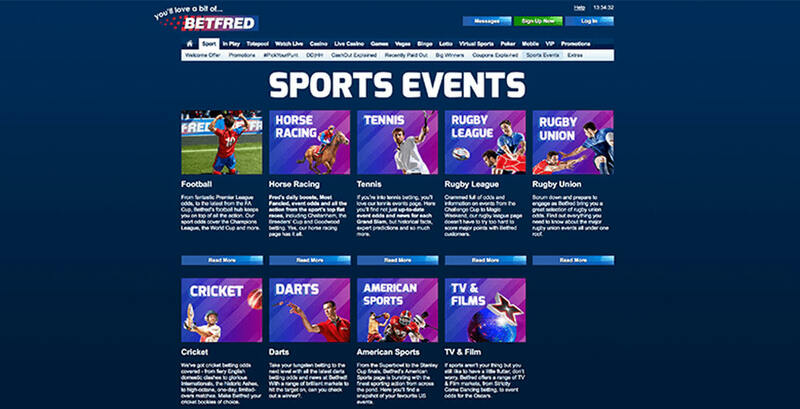 While waiting for the sport or race to start, check the two casinos offered by Betfred. But if you want to play against other players, you can go to the Live Casino section. Here, you will find live roulette, blackjack, baccarat, and hi-lo. The generous offers of the gaming site do not stop there as you can play bingo, lotto, and poker onsite. The online bookie accepts only GBP and EUR. You will also find a few payment solutions available. The lowest amount that you can send is £10, except if you prefer to pay through Visa or Mastercard. The highest amount that you can top up your account with is £35,000. You can withdraw at least £10 daily. You need to submit a withdrawal request first and wait for the confirmation message before you can get your funds. Betfred: Is It Worth It? Betfred has almost everything: sportsbook, casino, live casino, poker, and lottery. There are generous deals that you can get per section. Plus, you will not run out of games to play with the site’s huge game library. You can wager on around 28 sports or try the casino games available. 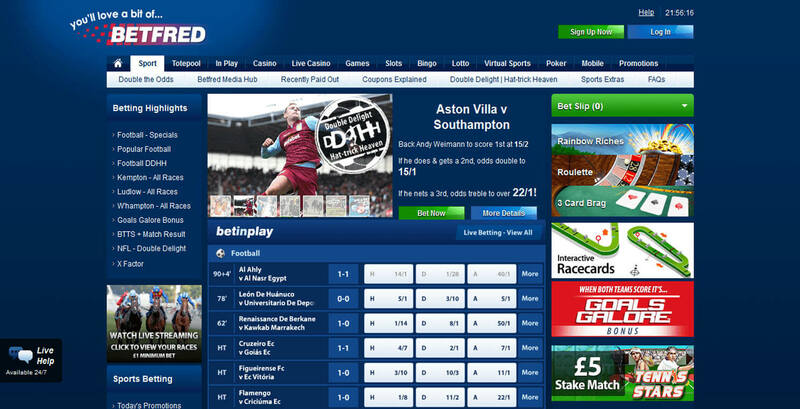 Although it may seem that Betfred is the perfect betting site to join, it lacks in some areas. It does not accept cryptocurrencies, and its supported currencies and payment methods are few. On top of those, the online bookie accepts only players from the UK, Ireland, and Gibraltar. Betfred even had issues with its anti-money laundering controls and received player complaints on withdrawals – good thing Betfred already made actions to address these issues. Overall, becoming a member of Betfred will still be worth it. After all, the offers of the betting site are hard to resist, and the issues it faced were already given actions. But if you are bothered about the downsides of the gaming site, it is better to expose yourself to other sportsbooks by reading more reviews.